"Swing "Fore" the Arts” 10th Annual Golf Tournament at the Casselberry Golf Club on Friday, August 31, 2018 was a great success! Golf enthusiasts enjoyed a great day of competition that included a breakfast and a delicious 4-Rivers luncheon with an Awards Ceremony. 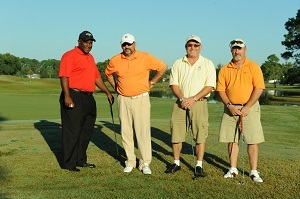 Thanks to all of the sponsors and golfers who participated! All proceeds benefit cultural programs in Casselberry and Seminole County. of Central Florida’s largest free musical events--the Latin Jazz & Art Fest. Company name mentioned on air when radio sponsorship is secured. Booth at event for marketing. Company banner displayed at event. Company logo included in pre/post press material, including press releases, media alerts, program, flyers, postcards, posters and advertisements. Public recognition of sponsorship at event. In addition to the recognition the business will receive, there are also many special “perks” involved with being a sponsor. Some sample “perks” include specially made signs, Latin Jazz VIP reception tickets with a meet and greet with this year's headliners, your logo in the festival brochure, and much more!